5 Signs You’ve Reincarnated On Earth Multiple Times Before. Some form of the idea of reincarnation exist in almost every community, across the ages. The reasons it happens, how it happens and the system in which it occurs changes depending on where and when in the world you are. 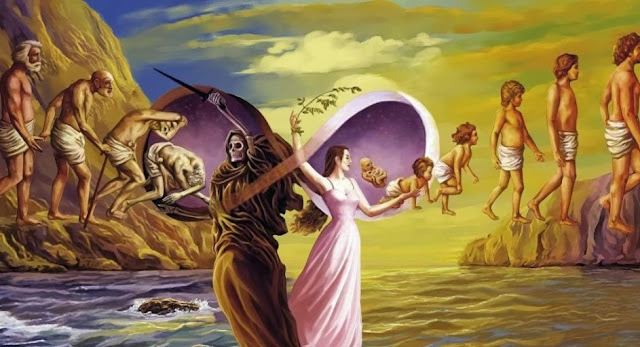 While a very serious concept in certain religions, reincarnation in the West is regarded as a mild curiosity. The idea clashes on a fundamental level with many Western schools of spirituality and religion. A soul continuing to return to Earth for different reasons, to inhabit different forms of life has certain similarities across the board. The way that the soul can get in touch with different lifetimes carries similar traits no matter the context. Listed below are those commonalities. If there is no chart-able development of a attitude, phobia, or personality quirk, barring psychological disorders, you may have picked this formation up from a past life. For instance if you were mauled to death in a past life you may not like dogs, in your current life. To a lesser extreme, your past lover, may have loved petunias. In this life you are allergic to them but always feel warmly and happy in their presence. The possibilities are endless and the consistent theme in all of them is a lack of an original cause and no discernible growth or nurturing. Basically, a formation (normally a negative one) appeared one day and continued to exist with out any prompts. Deja vu is the feeling that you get that have already experienced the present situation. There is no solid explanation for this phenomena. One of the prevailing theories is that that you are experiencing a situation that you loved through in your past life. In that similar experience, you are stretching through your life times and touching on previous experiences. The power of this is that through training you will be able to tell if the situation you experienced in your past worked out well or not for you. Dreams are one of two types. One is that they are complete nonsense, your brain firing randomly or for your entertainment. The other is that dreams are deeper, hidden aspects of your mind trying to communicate to you through metaphors and sensations. The only way to tell if different parts of your mind are communicating with you, is how they feel to you and whether or not they re occur. A dream that holds a legitimate message will come with a feeling of connection. During and after the dream you’ll feel as though an aspect of your mind or soul have opened. If you dream repeats and there is a general motif or an element is present in different dreams, it can be a pretty clear indication of your past life attempting to tell you something. There are cases where the message is fairly cut-and-dry; a character shows up, introduces themselves as a past version of you and tells you the message. These cases are rare. More often or not people are shown scenes from their past lives. It can take awhile to view enough scenes and glean the meaning and purpose of the message. Anytime a past life is actively striving to tell the current life something, it is important and time sensitive. This is one of the harder clues to a past life to pin down and explore. One day you find yourself reminiscing, you’ll realize that you know facts you never learned, know details of a place you’ve never been to. You’ll be unable to trace how you know certain facts. Sit down and focus on letting your mind drift. The pathway to these memories can not be located with a direct, unguided method. It a kind of formation that you have to catch out of the corner of your eye. As this information was presented with out haste, it means there is no dire need for your past life to communicate something. So feel free to take your time in your search for answers. I covered a story of a reincarnated youth that was killed with an ax blow to his head. He was born with knowledge of his killer and a glaring birth mark where his past skeleton had a fracture. The mark faded with time, but this is no clear indication of what can happen. Many spiritual groups around the world believe that birthmarks are the physical manifestation of past life’s intense negative energies. Some times they fade and other times they don’t.